(NH) We extend exclusivity, by Town/City, for our products (unless Private Labeled or differentiated). Currently Unavailable: Concord, Canterbury, Laconia, Littleton, New London, North Hampton, Warner. (MA) We extend exclusivity by customer demographics and location. (CT, RI, ME) We extend exclusivity per agreement. We are not currently partnering with businesses wanting to use our product for brewed resale. Our products are meant to be offered exclusively to the DIY / END USER segment. This exclusion applies to all cafe, restaurant locations. Exceptions to this policy includes Private Labeled products. 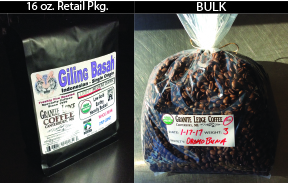 Granite Ledge Coffee is an established brand with many millions of cups of coffee roasted since 1999.
net 30 / 2% net 10 terms. Orders received by 6:pm Mondays are roasted and shipped/delivered the same calendar week. Processes available 24/7 via DropBox. Block bottom, matte black, stand up pouches. Heat sealed (nitrogen flushed option). Inquiries by eMail from the business domain. Inquiries from Yahoo, gMail, HotMail, etc. may be discarded.